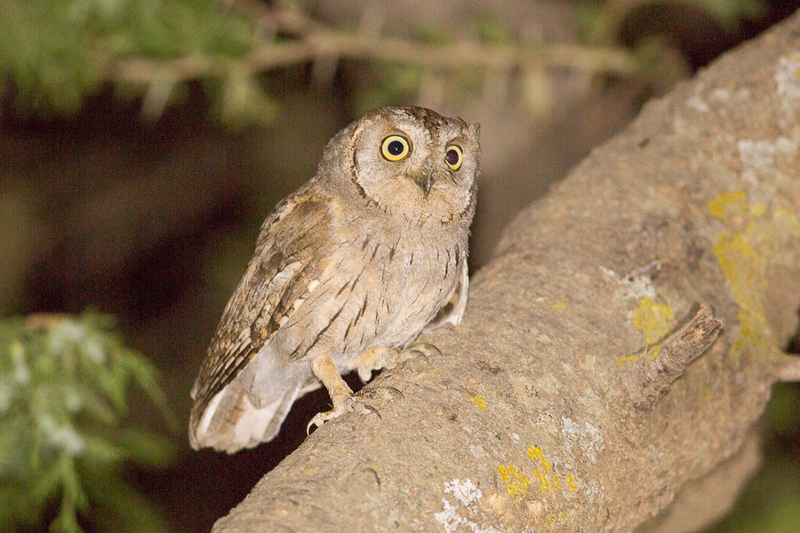 Arabian Scops Owl Otus pamelae has recently been split as a distinct species from African Scops Owl O. s. senegalensis. Recent work (Pons et al 2013) has shown African Scops Owl, represents a very distinct lineage and is well differentiated phylogenetically, morphologically and vocally from O. s. senegalensis. As a result it has been recommend to elevate it to species status, as Arabian Scops Owl Otus pamelae. The reasons for this are this southern Arabian taxon is highly divergent from African senegalensis (uncorrected-p mitochondrial genetic distance = 4%). The song of pamelae is very different from that of Eurasian Scops Owl O. scops and Pallid Scops Owl O. brucei but more similar to that of African Scops Owl O. senegalensis. It nevertheless differs from the latter’s song in being higher pitched, sounding ‘scratchier’ and having more prolonged notes; the song sounds two-parted, due to the much quieter first note. In terms of biometrics, results clearly suggest that pamelae is longer winged and longer legged than mainland African populations of senegalensis. In comparison with populations of O. senegalensis in continental Africa, Arabian pamelae is distinguished in being paler overall, with less distinct streaking over the underparts and a less obvious whitish line on the scapulars. Arabian Scops Owls possess several diagnostic genetic and phenotypic characters and it is therefore consider the most appropriate taxonomic treatment is to recognize Arabian Scops Owl as a species and not as a subspecies of O. senegalensis as it was originally described based solely on morphological data. This change means that Arabian Scops Owl becomes a new Arabian endemic, found in South-west Saudi Arabia, South-west Yemen and north-east to southern Oman and African Scops Owl is now no longer found in Arabia but instead occurs in parts of Ethiopia, Eritrea & Somalia.